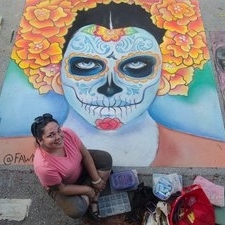 Fawne DeRosia is an artist from Thomaston, Georgia. 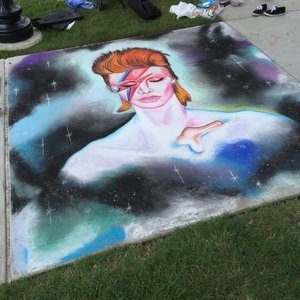 In November of 2014, she came across an ad for a "Sidewalk Chalk Festival". 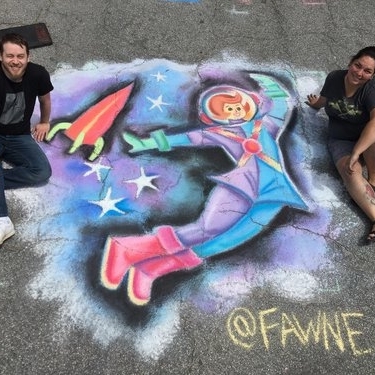 Never having done chalk art before, she entered the contest anyway thinking it would be an easy win with her artistic background. She then learned about the crazy skill set it takes for creating an art piece with chalk, lost the contest, but fell in love with the medium! Fawne loves creating her art using a variety of mediums. These mediums include painting, sculpture, window art, and murals. She enjoys trying out new techniques as well with her art from watercolor to acrylic, to oil and even occasional wood working. She is the founder of Flint Rose Studio, where she increases her body of work, hosts art workshops and paint-along parties, and works to foster the growth of art culture in the greater Thomaston/Upson County area!